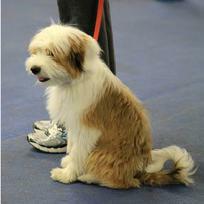 Puppy Classes at Saint Paul Dog Training Club are open to dogs at 8 weeks of age. We require that all puppies participate in a vaccination protocol developed and overseen by a practicing veterinarian, and generally in compliance with the American Animal Hospital Association guidelines for dogs. Owners will be required to provide evidence of a vet visit and vaccination plan/history at the first class. If your puppy shows signs of illness, please do not bring it to class. For more information see the PDF article “The Dilemma of Socialization and Immunity” by club member John Scandurra, DVM. During this eight week course you will be introduced to a variety of ideas concerning positive motivation with a focus on play, praise and treats. This class is for puppies age 8-16 weeks. You will learn socialization, motivation, and preliminary obedience. Additional topics include house-breaking, chewing, biting, jumping, shyness and more. 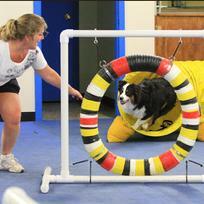 Plus puppies will get a taste of the sport of dog agility! In addition to you and your dog, you will need your own soft small treats, a buckle collar, a soft or favorite toy and a 6 foot leash. Cost: $80 for 8 week class. Classes are offered Tuesday nights and begin approximately every four weeks. Puppy Einstein class times are 6:00 and 6:45. To secure your spot in class you must mail the completed application along with your check. You may also sign up in person on Tuesday nights 5-7 pm but post marked applications are taken into consideration first. This class normally fills up one or two weeks prior to the start date. When we receive your completed application and check in the mail we'll reserve your spot in class. If it's within two weeks of the start date please email the Director of Obedience for class availability at Puppy@spdtc.com. Download an application form (Microsoft word file) for this class. You may also download the application form in a PDF file format. If you have any questions or concerns, please email us at Puppy@spdtc.com. We welcome your thoughts and ideas. Feel free to email obedience@spdtc.com with any correspondence. Want to build a winning Obedience dog right from the ground up? Here’s where you start. Our Competition Puppy class is an in depth, two section journey that will guide you on your start to the Nationals. Or, if that’s not your goal, you’ll still build a dog that will be a joy to show and have in your family. This course, developed by Trainer Claudia Roberto, combines successful methods drawn from several nationally known trainers and seminar presenters. It’s a hands-on result driven small group environment that will get you going with skills that will support your Obedience goals and a relationship with your new puppy that will benefit every facet of your life. Because it is designed for current and future Obedience handler, prior obedience training and show experience is desired. But, if you have never trained and shown a dog but want to join the sport with the best possible head start, talk to the Director of Training or Class Instructor for details. Puppies should be at least 14 weeks and no more than 26 weeks of age. The younger, the better. The program consists of two 8 week sections, part one and part two, taught back to back. Due to the small nature of the classes, (strictly enforced 6 team limit), the fee is $175 per section. Many materials, tools and handouts will accompany these classes and are included in the price. Cost: Competition Puppy is $175 per 8 week section. For more information on Competition Puppy contact Claudia. This class is for anyone with a new puppy. Although it is geared for the performance dog, it can also be a great time for the stay-at-home puppy. Through play and clicker training, you will develop a close working relationship with your puppy. Designed for fun and learning, this class will give your puppy a super head start on any future training. Puppies will come away with the ability to focus on you, find self-control, enthusiasm, drive, balance and be willing to try new things with confidence. Puppy HeadStart I @ 6:00 p.m.
Puppy HeadStart II @ 7:15 p.m. Cost: Puppy HeadStart is $170 per 10 week block. This eight week course is for puppies who have graduated from Puppy Einstein, and are too young and/or immature for Beginning Obedience. Please bring soft small treats, a buckle collar, a soft or favorite toy, and a 6 foot leash. Cost: $80 for 8 week class. 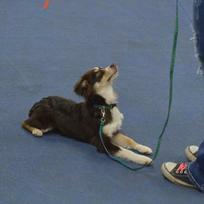 Senior puppy classes are scheduled as needed, classes are offered Tuesday nights at 7:30. Please email us at Puppy@spdtc.com to find out when this class will be offered next.